Our Norway maple was amore than 80 years old ... and enormous. Norway maples can grow to over 100 feet tall, and this particular one was so thick that I don’t think 2 adults together could have gotten their hands around the bottom of it. 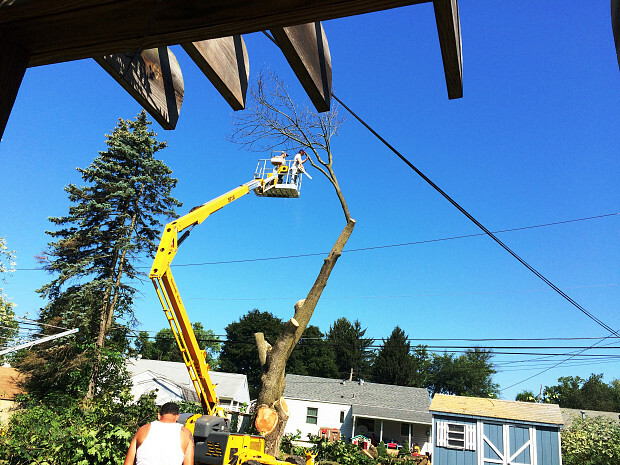 It had a couple of dead branches that needed trimming, so I was looking for a tree service in my area. 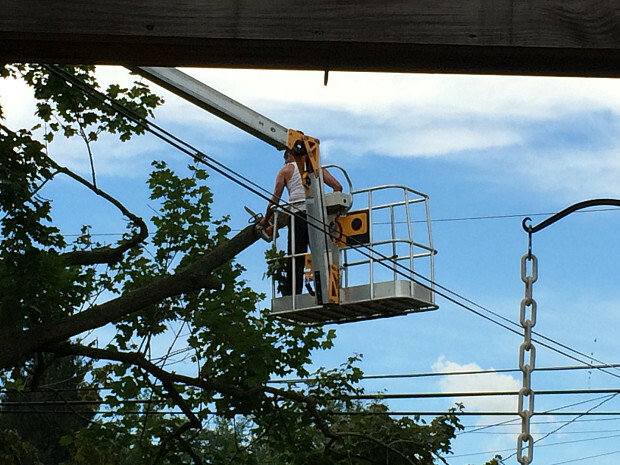 After I went online to find a contractor for the job, Angry Al's Tree Service called me quickly and made arrangements to come out to my home. When he couldn’t keep that appointment, he called me and changed it. I was pleased that he didn’t ignore me. I didn’t get any other estimates – and the reason I didn’t was that I had an idea of what it was going to cost me. Angry Al’s came in below what I was anticipating, which is why I just went with them right away. 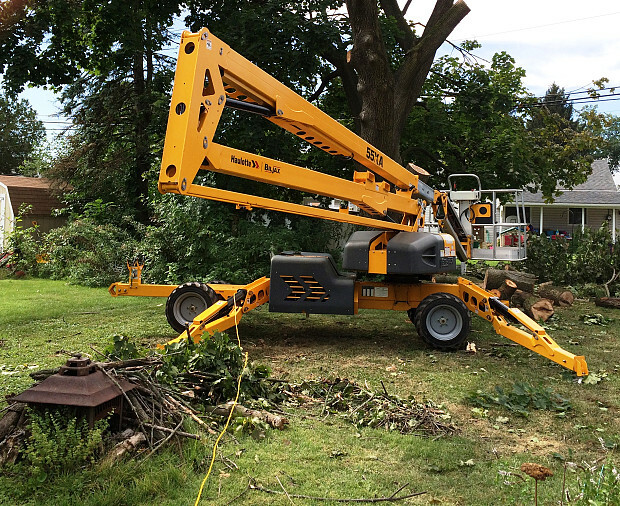 On the day we’d scheduled for the removal, Al came with this huge lift, fitted with a bucket that could hold a couple of people. They trimmed the whole thing right back to the trunk. I was watching most of the time and it was very entertaining. There were power wires all over the place, and sheds, and kiddie toys. And the crew didn’t damage a thing! I don’t know how they picked which branches came down first because I couldn’t see a pattern to it -- but I’m not the tree person either. The last set of branches came off the top, which kind of surprised me. I do know that they were really careful around the wiring. They definitely didn’t do anything risky, like take a big branch and try to flip it over the wires. 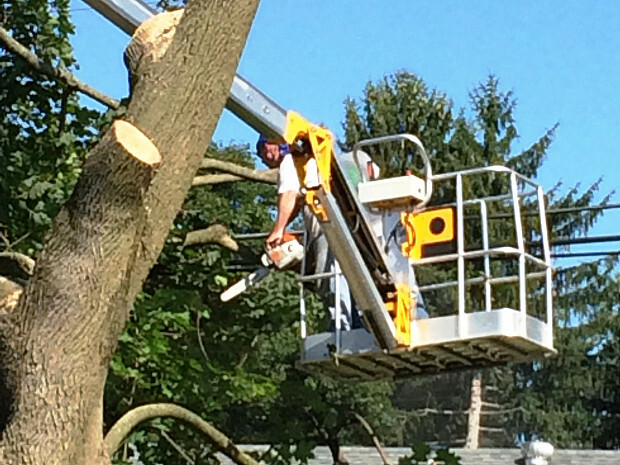 To take down the trunk itself, they trimmed the maple down to about 10, 12 feet off the ground. Then they put a rope around the top to control its fall before cutting it down at the base. After the whole log fell over, they trimmed it on the ground. They were here for 2 days. Day One, they had problems with the lift. Once they got the lift fixed, they came back and finished the job. 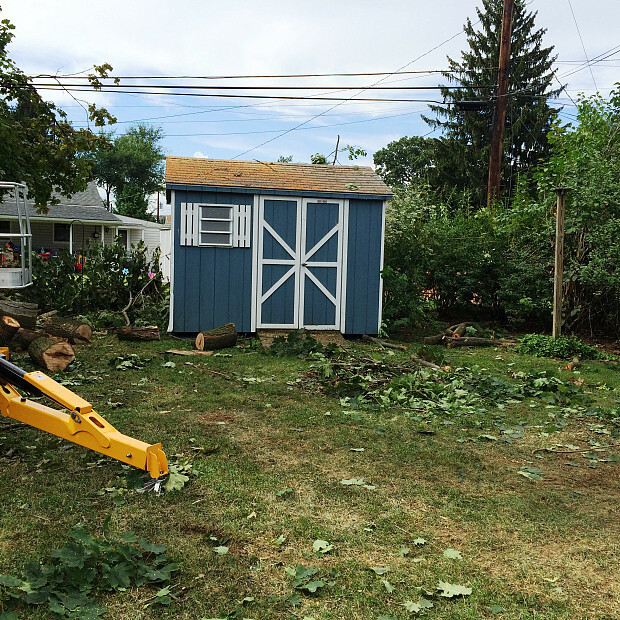 The first day, they hauled all the wood and everything away. The second day, they started to take it away, but when my neighbor came over and asked if he could have it, they dumped the wood in his yard. So everybody was happy. I’m waiting till October to have the stump ground. The contractor told me it would be better to do it then because after they grind the stump, they’ll bring in a truckload of dirt and plant grass seed on the site. He said the seed wouldn’t grow in August with all the hot weather – it would just be food for the birds. I was pleased with how this whole thing progressed. The crew was very professional, especially in how they really cleaned up my yard. They took a rake to it; they took a blower to it; I had some old branches out there that I had just stacked up and they cleaned all those up too. If anybody asks me for a recommendation, I would give them one. Angry Al went above and beyond. A Kitchen Cabinet Repaired Before It Got Seriously Damaged by Debbie G.